Autosport Labs Black Friday – Cyber Monday: 15% off store wide! Enjoy 15% off for nearly every product during Black Friday through Cyber Monday weekend! 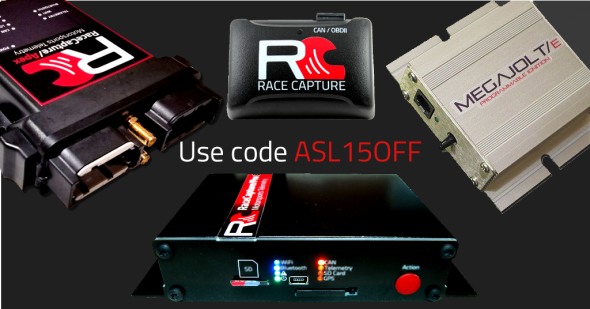 Get the plug and play RaceCapture/Track at 15% off, or get a RaceCapture/Pro MK3 system with the sensors you want, or opt for the high end RaceCapture/Apex system – your entire cart is 15% off. Even get 15% off the Megajolt Crank fired ignition + accessories! Use the coupon code ASL15OFF to get the 15% off during checkout. Sale excludes excluding Texense Sensors; coupon code cannot be combined with other coupon codes or promotions.